How to Sync Google Contacts with iPhone X/8 Plus/8/7/6S/6? Home> Resource> iOS Transfer> How to Sync Google Contacts with iPhone X/8 Plus/8/7/6S/6? How to Import Google Contacts to iPhone X/8 Plus/8/7/6S/6 for Further Using? People are used to save lots of contacts info in their Gmail or Google account, so if you can find a good way to sync these info to your new-purchased iPhone, then you'll save lots of time on manually typing contacts on iPhone in the daily life and work. Generally speaking, the methods of transferring Gmail contacts to iPhone have a little bit difference according to the iPhone's operating system. So in the following contents, we'll divided into two different situations to explain the detailed syncing steps for your reference. 1) Tap Settings on your device, and find Mail, Contacts, Calendars. After that, you can click Add Account and choose "Google" as your option. 3) Turn on Contacts option here and click "Save" button on the top right panel. 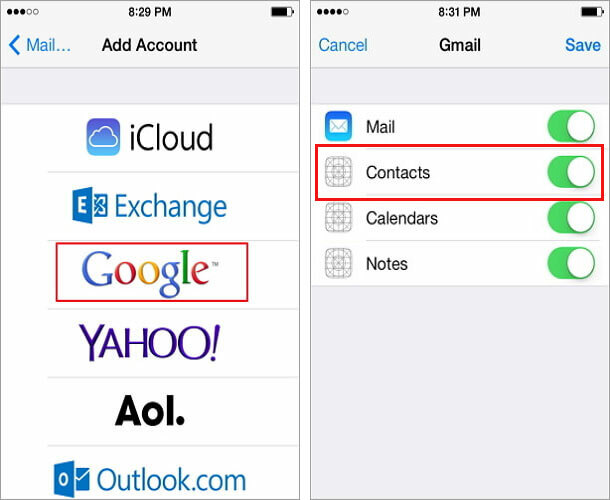 1) Follow the same steps as above: Tap Settings > Mail, Contacts, Calendars > Add Account. After that, you need to click Other option to continue choose Add CardDAV Account. 3) After that, you'll enter the Advanced Settings, here please be sure that SSL is on and the port is 443. Then click "Next". 4) Return to the Home screen on your iPhone and tap Contacts. Then the syncing process will begin automatically. Wait for a little while, all contacts on your Google account will be copied to your iPhone without losing. Now, you can enjoy your new iPhone as you like. If you wish to sync iPhone contacts with Gmail, here is also an detailed instruction for your reference: how to sync iPhone contacts with Gmail. And during the using of the device, please remember to backup contacts from iPhone to computer regularly so that you'll mistakenly delete or lost any important contacts. Or even though the contacts have been lost, you still can use a simple tool to recover contacts from iPhone or iTunes backup easily. Want to Transfer CSV from PC to iPhone? Solutions are Here! How to Export iCloud Contacts to CSV Format? How to View iPhone Contacts on Computer/Mac? How to Export Contacts from iCloud to Outlook? How to Easily Manage iCloud Contacts? How to Effectively Sync iCloud Contacts with Google?